We all know the story; against all odds a man overcomes his hardships to rise up and succeed. A narrative that has it all, suffering, love, and victory… the story of the underdog. This is the first installment of our “What Makes You Thrive?” series. What Makes You Thrive will feature members of the community with a story to tell. 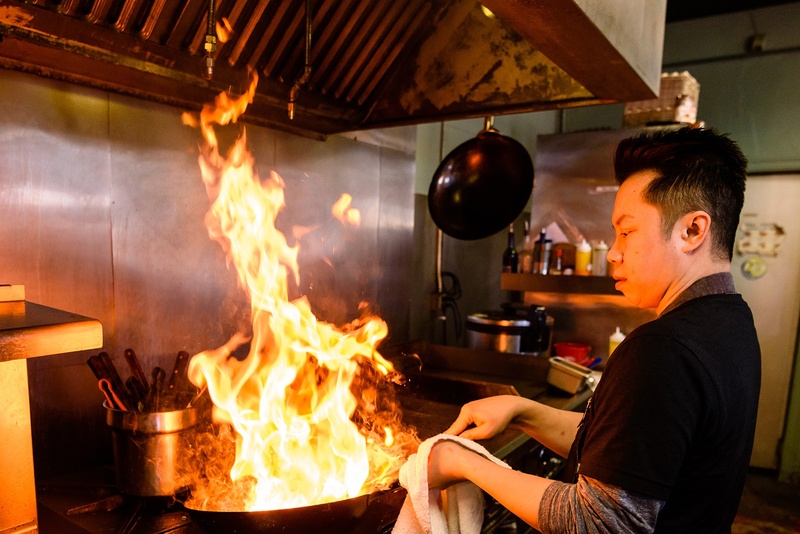 We’re leading off with chef James Vu to get the party started. James is a person who has always been doubted while searching for a fulfilling career path and a purpose in life. James has a story worth telling. The Q&A reflects a man who is not only a restaurateur but an innovator and inspiration. How did you end up owning a restaurant? My brother was going to school to become a doctor, and my lack of career path was a stark comparison. I went to OU as a pre-med major and dropped out. I was living life day-to-day. Learning the streets and how to have thick skin. I was working at Best Buy doing sales and although I was a good salesman I quickly realized that I was replaceable just like the next person. Fast forward a few years and my Mom and Chip Fudge helped me to buy Kamps. It had been a family owned restaurant since 1910 and had a grocery store, coffee shop and fresh cut meats. Mostly it was focused on food and produce. 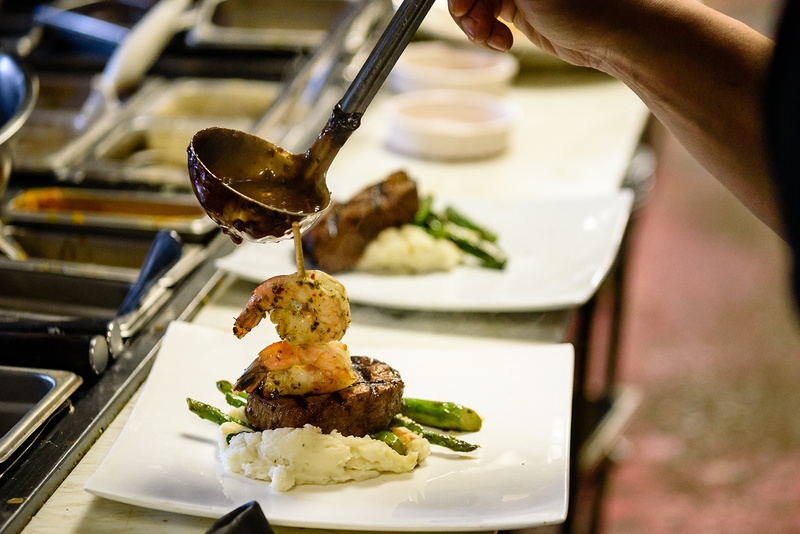 At what point did Kamps change from a grocery to a restaurant? And how did you end up the chef? I saw potential in the meat business at the time. So I dedicated myself to learning the ins and outs of meats, butchering, cutting and quality. I came in every day for the first three months at 6 a.m. to watch and learn how the butcher would work. I committed myself to learning as must as possible about pork, chicken, poultry and all grades of meat and even the tools used. I knew that opening a deli was the obvious next step. So I got a side job apprenticing at a larger deli that I knew would let me travel and learn the things that work and what doesn’t. So a year and a half after buying the grocery store it became a deli. How did Kamps become La Brasa? I may not have known beforehand, but I had the willingness to succeed and the determination that I would learn anything and everything I could. Today I still have that mindset when people question my capability. If you're given a chance in life, you grasp that moment as fast and as hard as you can. Moments like that don't come often. Kamps was a great opportunity for me. After meeting my wife and getting married I started planning my next big project. I loved Peruvian food and I knew it well. Growing up, I used to visit my grandmother in Washington, D.C. and there was an amazing Peruvian place down the street we would go to often. I started doing research and decided to open La Brasa. There were so many people telling me I shouldn’t and I couldn’t do it. Even my brother reminded me that less than twenty percent of businesses survive. But that didn’t keep me from trying, because I knew that I would succeed against any odds. Instead of backing down in the face of adversity, I traveled more to learn about Peruvian food from the best and most authentic places around the country. I read and watched all of the material I could get my hands on. 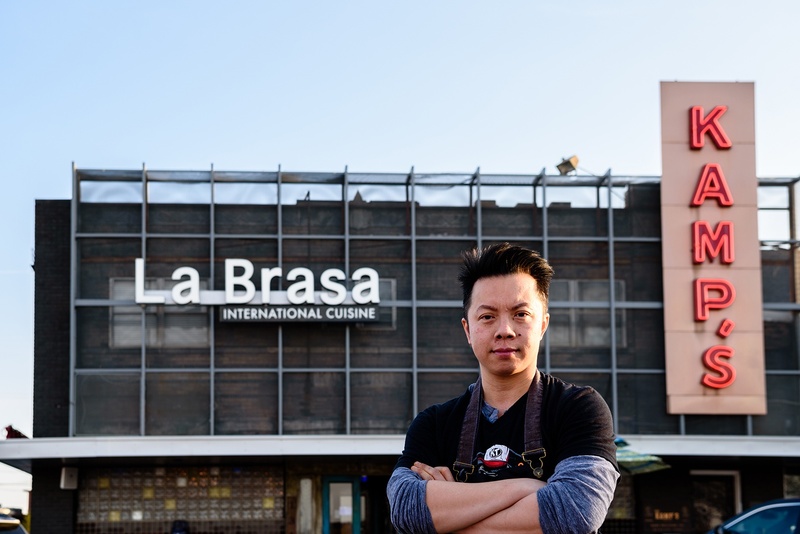 With my new found knowledge and my steady work ethic I was able to shape La Brasa into the success it is today. At what point did you end up the chef? I had a falling out with my cook at the time. Right in the middle of a giant catering event and on a busy weekend full of reservations. Almost all of my staff including the cook walked out on me. I convinced one of the other cooks to stay behind and help me. That night we had to comp about half the food. After getting home late that night, I couldn’t help but cry. I knew this was going to be my greatest challenge to date. I had to take over the kitchen in order to help get the food out while we hired more staff. It was brutal. But my wife reminded me that I am not a man that gives up. I do not quit. So I devised a plan that night and I came in early the next morning to prep. We called every single reservation we had that night and apologized for things being slower than normal. Our ratings on Yelp dropped from a 3.8 down to near 3. But I knew we would be able to comeback even better than ever. Your latest concept, Kong’s has been extremely well received. How did that come about? My buddy Shyon and I had always wanted to do business together. Originally it was going to be a beer garden. But when this space became available we jumped on it and it quickly materialized. We found this giant 8-foot-tall gorilla at an antique shop in Texas. On the plane, back to Oklahoma City that’s where we came up with the Kong’s concept. It started with the statue. Through all of this what have you learned about success and failure? I failed so many times. It taught me that I have to accept it and to know that when failure rears its ugly head, I can handle it. No matter how awesome you think you are, everyone's replaceable. 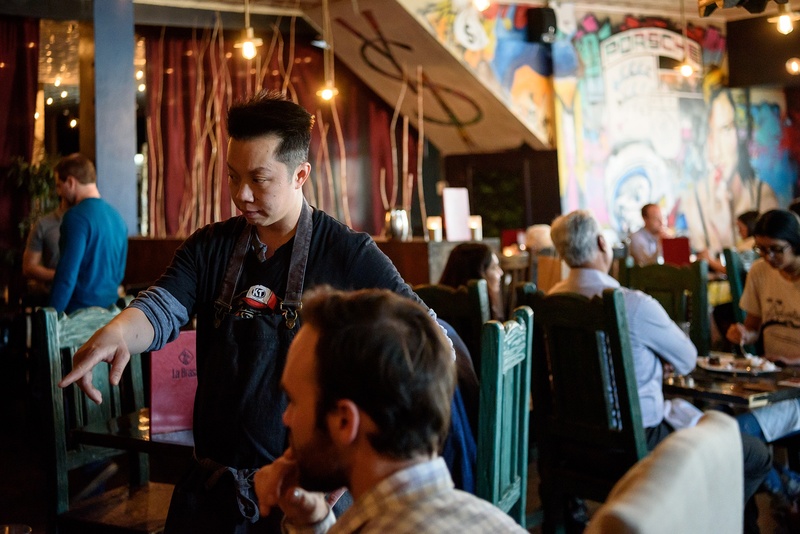 At La Brasa, I have had the opportunity to learn all the different jobs for that very reason. 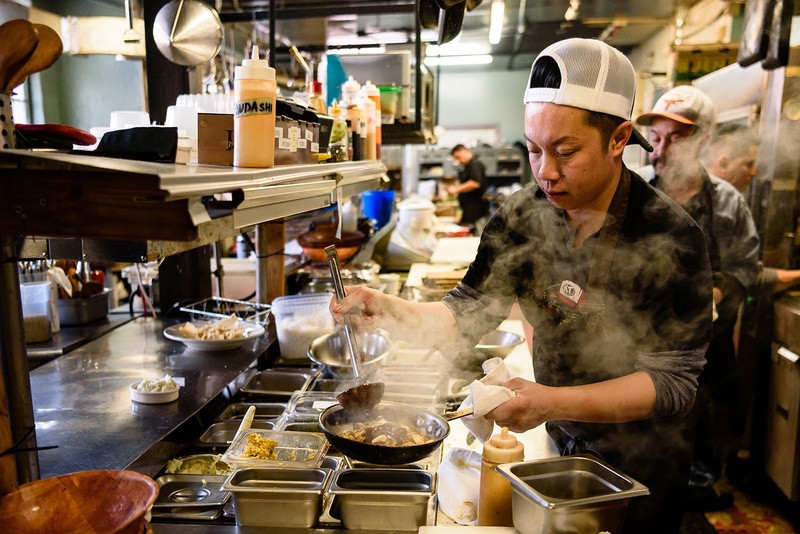 From a 27-page business plan to buy Kamps as a grocery and meat market to today’s success with La Brasa being named one of the 10 best overall food and best overall dining experience on OpenTable... it has been a wild ride. I have experienced so many things through my work. I have traveled to learn and bring ideas back to La Brasa. I even had the chance to be on cutthroat kitchen as a competitor. I feel like La Brasa is a representation of me and my hard work and success. I’ve been at the lowest of the lows, but I always come back. So I know now whenever I see something that may be overwhelming at the time, that there's a plan at the end of the day. Now I have the right tools and the right people around me. Once you've been there, you're not scared anymore.